Having this guy be healthy is paramount for success in 2018 for Portland. It's been quite a while since we've had any Portland Timbers soccer to watch up close, but seeing match action always signals that we are getting close to the 2018 regular season getting started. There's plenty to determine before Portland officially takes the pitch versus the Los Angeles Galaxy at StubHub Center on March 4, but for now, Timbers Coach Gio Saravese will get his first chances to see his charges in match action. The Timbers started off the pre-season slate with a draw against the San Jose Earthquakes on January 31 that featured 3 different groups playing 30 minute periods with just regulars Alvas Powell and Diego Chara sitting out for injury. Powell continues to recover from a sprained wrist that the Timbers have been very careful with, while Chara continues to rehab from a broken foot suffered in the Houston playoff series that ended the 2017 MLS season. Powell was able to participate in match number 2 on February 3 when Portland battled their rivals from the North, the Seattle Sounders FC, as a starter but left after 40 minutes while Chara didn't appear. However, every healthy player - except for Roy Miller who is still recovering from the ruptured Achilles that ended his 2017 season - has now appeared in game action for Savarese to see up close and personal. Diego Valeri scored early in the first half for Portland, but the Sounders got goals in both halves to post a 2 to 1 victory. 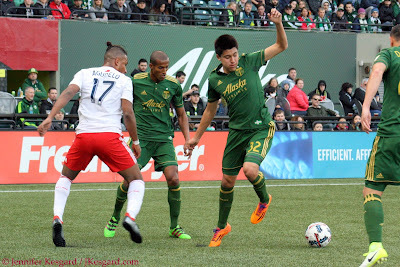 Portland now gets a bit of a break before returning to Arizona for 4 additional preseason matches between February 14 and 24, which gives us a chance to look at the current make up of the roster. Are you team Jake or team Jeff? The news that striker Samuel Armenteros is officially in town and was officially signed soon does change the complexion of the club roster greatly. After photos of Armeteros at Portland International Airport hit social media and several tweets indicating a medical exam had occurred, the rumors became very official days later when the team confirmed his addition. Armenteros does have a decent scoring pedigree, and at 27 years old, he could provide a scoring punch for many more seasons. Portland used targeted allocation money (TAM is designed to either pay down a salary number currently on the books, but it can also be used to bring down a proposed salary number for a new player) to bring Armenteros aboard on a loan deal for 2018, but they have the right for a purchase option for subsequent seasons. The signing brings the current roster to 31 signed players not including draft picks, so the Timbers would be 1 over the current allotted 30 if the season started today. All the moves bring intriguing talent and depth across the board, but it does add even more complexity for Savarese and his coaches to determine the starting mix of players that will begin play for the Timbers in March and appear regularly. If we break down the position battles in each category, there's still plenty of queries that need to be addressed before the season opener against the Galaxy in California on March 4. Yes, Larrys, we found some healthy center backs to play soccer with you. Goalkeepers: So who really is the starter of this club? Honestly, there are good and bad points for each person in the current mix, so it will be up to Guillermo Valencia to find out which keeper is going to work best in the new system being employed. Savarese wants the keepers to be an outlet on the attack and be comfortable with the ball at their feet to either trigger the offense or relieve pressure, so this will be a very different approach from what we've seen in previous seasons. Attinella is very good at commanding the goal area and making solid decisions in traffic under pressure, but he's also had bouts of inconsistent play during his career. Gleeson has the best reflexes of the group and can make very good reaction saves when called upon, but when left to make a decision with time, he can be indecisive. McIntosh might be the most athletic of the three, and was easily one of the better players on the Timbers 2 roster last year with highlight reel saves and penalty stops. However, the entire T2 defense was a disaster and it might be difficult to know how much McIntosh was responsible for the conceded goals. Each keeper has advantages even if they aren't "the complete package", but the best part is that the team seems very comfortable with any of them in the back. I give Attinella a slight edge because of experience and leadership, but I also expect that Portland will go with the hot hand at the time depending on status. Gleeson was playing fairly well last year until injury put him on the shelf, and Attinella took over the job for the rest of the 2017 season. Wing Defenders: Will the real Alvas Powell finally show up in 2018? He's always seemed to be on the cusp of something great, but his performance has usually been erratic at best if he's not injured. At times, his contributions to the offense can't offset the issues in defending, but it's followed up by a great defensive effort yet no aid to the attack. While I think the veteran combination of Vytas and Valentin will get the bulk of the minutes and Farfan will press for spot appearances as he gains exposure and confidence, this group will only get stronger if Powell can contribute consistently, especially on both ends. I'm still expecting Savarese to employ overlapping runs on offense and distribution from the fullbacks, so this group will need to stand up and be heard regularly if the Timbers are going to have any success this year. Vytas is the best crosser of the group and Valentin is the unsung heart, but if Powell can tap into his potential, it could rise the entire profile of this group from average to exceptional. It's great to have someone with a ton of experience with Myers available off the bench, but much like 2017, Myers would only really appear if there are significant injuries or absences to the other players. Sebastian Blanco become more valuable as 2017 progressed. On to 2018! Center Backs: I have always made the joke that center backs for the Timbers are like drummers from the movie "Spinal Tap", but the joke wore thin in 2017 as Portland suffered several significant injuries to their group. Ridgewell appeared in 15 matches, but the man signed for significant minutes, Gbenga Arokoyo, was injured in pre-season and replaced alternately by Miller and Olum. Mabiala was signed mid-season mostly because of Ridgewell's absence, but he ended up being the strongest center later in the year. With Arokoyo gone now as part of the Nagbe trade, Miller still recovering from injury during the 2017 playoffs, Clarke's status still unknown due to injuries of his own, Portland needed to add depth, which they did by adding Cascante and Jadama. Cascante is young and raw, but has enough talent that he should be able to push for minutes, while I actually expect to see Olum more in his natural position in the defensive midfield, so the major minutes should rotate between Mabiala, Cascante and Ridgewell with Jadama and Clarke being key reserves. The most intriguing name in this group was Tuiloma, signed to Timbers 2 late in 2017 who scored 3 goals in 11 appearances. The team made him a bona fide offer to stay in Portland, but they didn't reach contract terms until mid-January and his addition does add some youth to the mix. Savarese has always said he will play those that work hard and are in form, but I imagine that Ridgewell and Mabiala will be the top choices at center back health permitting. By the end of the year, however, that could change if the youngsters are able to perform - I wouldn't be shocked if we saw a Cascante - Tuiloma pairing at some point. Defensive Midfielder: Let's be perfectly honest, as long as Chara and Guzman are healthy and available, they will plug into the central midfielder each and every week. Between organizing the first line of defense, creating turnovers, frustrating attacking midfielder and providing distribution for the offense or defense, Diego and David are huge keys for the Timbers. Their status, however, is a bit up in the air - Chara broke his foot during the playoffs and is close to returning to full practice, while Guzman will be with the Costa Rican national team this summer for the 2018 World Cup. With both players also being among the leaders on the team in cautions and any suspensions for accumulation, having depth here is a huge priority for Portland. While Olum and Valentin can provide cover here - Olum was actually signed for depth here and Valentin has filled in admirably when needed - it's the acquisition of Paredes that has folks excited. While still in his teens, Paredes has shown similar skills in distribution and creating turnovers in previous stops, and if he's able to continue this trend and further expand on his skills, he could eventually be the heir apparent in the midfield in a few years. I don't expect Chara to go anywhere anytime soon, but having a viable succession plan is paramount for this team. Adding veterans is good, but this is a big offseason to cultivate Timbers youth. Attacking Midfielders: I love Valeri and his skill set, but I am very worried if the Timbers need to count upon a repeat of his 2017 MVP season where he tallied 21 goals and 11 assists. If he puts up comparable numbers within a balanced, dynamic offense, this would be really exciting to watch as Portland would likely exceed the 60 goal mark scored once again. However, if he ends up having to bear the brunt of the scoring punch in 2018, it could make for a very long season. The Timbers don't have Darlington Nagbe anymore, but they kept Blanco and Asprilla as the attacking wings with Barmby, Arboleda and Flores being the substitutes with Williamson being slotted more in the center like Valeri. There is a tremendous amount of speed and talent here, and if Blanco can continue his progression from his late season play in 2017 plus Asprilla continue to mine his talent, this trio will cause headaches for most MLS defenses. I love seeing Barmby's scrappiness on the pitch, and I surmise he will make a few appearances over the year, but it will be interesting to see if Arboleda can break into a more regular substitute role. Flores is really a utility midfielder who can play in lots of spots on the pitch, so that versatility can be very useful if Savarese needs to cover a position during a match for injury or just wants to shake up the attack as needed. This group will be as successful as Valeri in 2018, but the question will be if Diego is the sole contributor or if he will be the leader of a very powerful group of attacking players. I'm betting on more of the latter, especially with Blanco having a full camp to get acclimated. Forwards: The Timbers offense was successful for most of 2017 until Adi was injured in August playing the Los Angeles Galaxy. While the group continued to score reasonably well, the threat of having a consistent scorer as the lone striker was diminished greatly when Darren Mattocks and Ebobisse were the main options. While both forwards had moments of greatness, it didn't measure up to what Fanendo was able to do when healthy and available. Adi is back and ready to go, and while Mattocks has packed his bags to head to D.C. United for this year, Ebobisse is back as well. The two have some big company with the additions of Polo, Langsdorf and Armenteros. Langsdorf completed a very successful collegiate career as an accomplished scorer while also being a member of the Timbers Academy, so adding his as a Home Grown Player was a huge coup for Portland. The other two adds had some intrigue to them - Polo was targeted for several weeks before his services were eventually acquired, but there were several moments where the deal looked dead. Armenteros was a late add to the side on a loan deal, but his pedigree as an accomplished scorer just adds more spice to a quintet that already has powerful options. We might not see as much of Adi as the lone striker or there might actually be a rotation of talent depending upon form, but what Savarese has here is differing options. Adi can hold the ball in traffic well, distribute and find supporting runs, which actually mirrors much of what Ebobisse brings to the table, while I would consider Langsdorf more of a traditional soccer scorer. The elements of speed with Polo and headiness with Armenteros means the Timbers could employ 4 - 3 - 3 or 4 - 4 - 2 and still possess dangerous options up top. I think these guys and gals are ready for March. So What Does This All Mean? In the simplest of terms, Portland can now employ a wide variety of attacks and defenses with actually having players to employ those styles. While last year's group had some of the same skill sets, the Timbers were caught with depth issues at forward and center back that held them back from being within MLS elite in 2017 - yet the team still finished top of the Western Conference while securing a Cascadia Cup along the way. If you would have told me this group could trade away Nagbe and come away stronger in the process, I might not have believed it but it appears initially to be true. Portland will miss Nagbe's ability to hold the ball and dribble in traffic, but what they were able to do with the move is add depth to the wings and bring on young talent for the next few seasons. The real keys here are the health of the center backs to keep the group solid and fresh, but my initial thoughts are that Cascante, Tuiloma and Jadama have been solid enough to allay some concerns. The Timbers get a brutal 5 match away stretch to start 2018, and while they get a long home stand in late July and early August, their schedule in late August and early September features 2 cross country trips and compressed fixtures. With several other teams making big moves in the Western Conference, the ability to repeat won't be easy - but I like their chances as of right now. Some of these moves will also help Timbers 2, which really had issues on both sides of the ball. Getting some of the younger players meaningful minutes will be paramount to development, especially for the Timbers in future campaigns.